Bipartisanship is often held up as an ideal, but in fact it has been relatively rare in the history of U.S. politics. Still, the degree of polarization over the last decade has been severe, and many people see the U.S. Congress as teetering on the edge of dysfunction. "Despite the frustrations with Washington, we believe there are solutions to the gridlock and are excited to pull back the curtain for more people across the country to get involved in our democracy!" Murphy stated in a news release. "We're grateful for anyone willing to have an open dialogue about fixing D.C. and honored that these schools and groups have opened their doors to us." 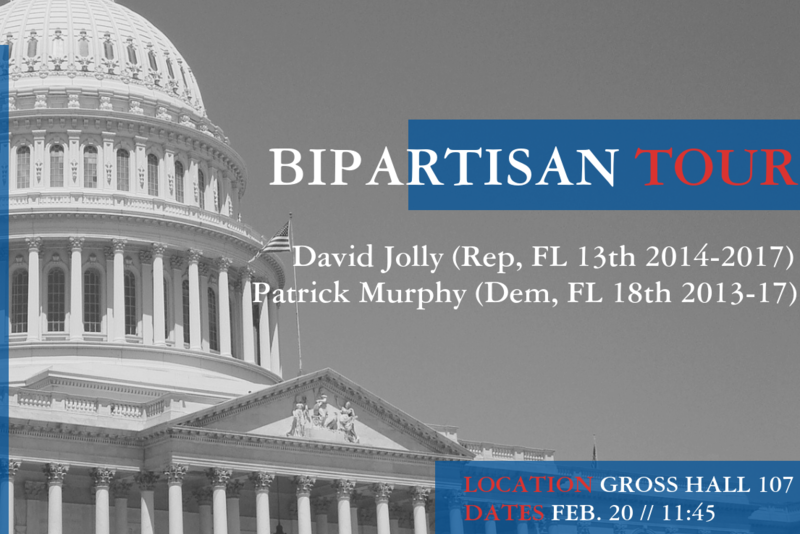 "The response to our town halls has been overwhelming and I think that speaks to the desire by people to see Republicans and Democrats work together, not against each other, to solve our biggest issues," Jolly added. The duo have appeared at Harvard, Tufts, MIT, Chicago, and other universities, and now they are coming to Duke! The event is open to any member of the Duke community, and will have time for questions from the audience. Please attend!